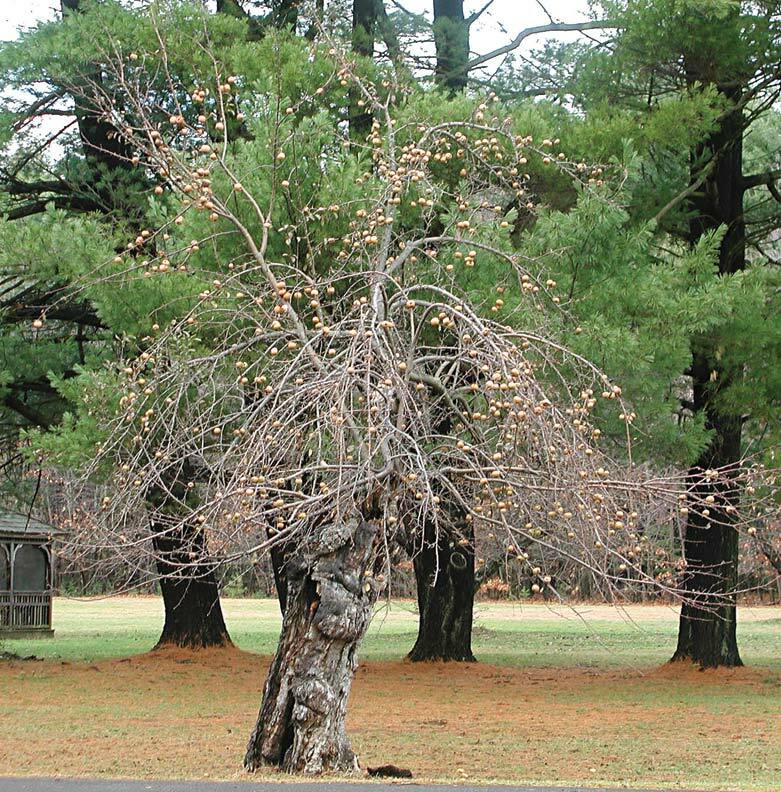 Neglected trees are tall and gangly, with fruit atop towering branches. 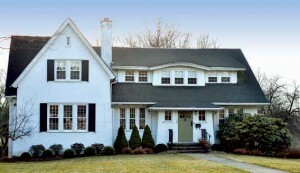 Inheriting an ancient apple tree with your old house can be a mixed blessing. 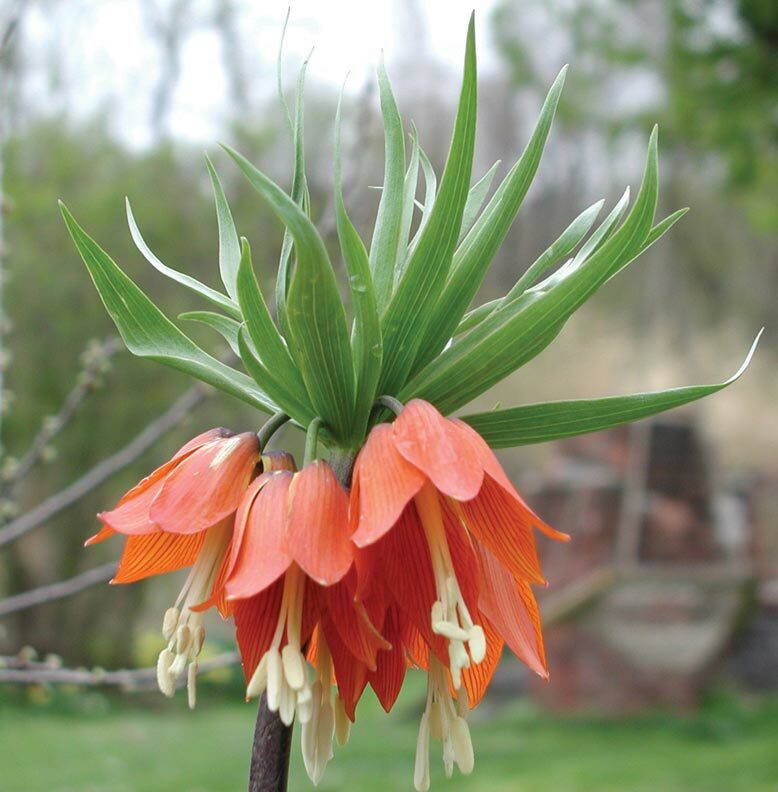 It will offer snowballs of blooms in the spring, the scent of ripening apples in autumn, and wizened, charming branches year-round, but its fruits will probably be small, pest-ridden, and not that tasty. That’s because apple trees need regular care to produce quality fruit. 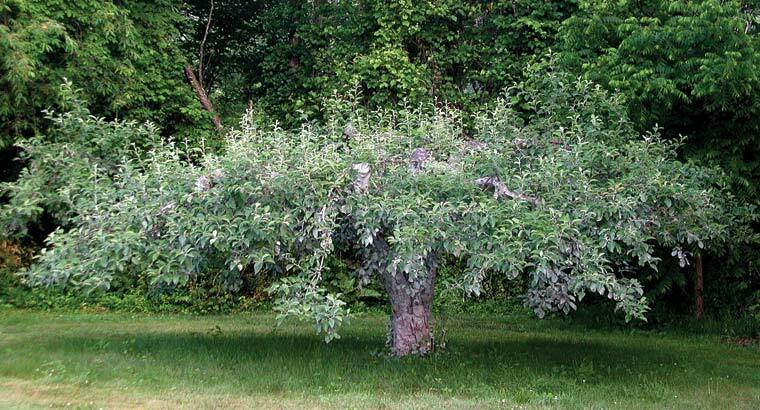 Luckily, you can return most old apple trees to bearing seductive, delicious fruits with a pruning technique known as renovation (a concept already familiar to most old-house owners). Without regular pruning, apple trees grow taller and taller to become top heavy, with upper branches that block sunlight from reaching the lower ones. Fruits—especially luscious fruits—require lots of energy to produce, and that energy ultimately comes from sunlight. Subsequently, any fruits borne by old, neglected trees appear mostly on the uppermost fringe of branches, where sunlight is plentiful. At this upper canopy, the fruits can be numerous but they are usually undersized and lacking in flavor, and they are also out of reach without the help of a tall ladder. Renovated trees have a pleasant, full shape and bear fruit within easy reach. Before you decide to renovate your old apple tree and start it on the road to delicious glory, ask yourself some questions. First, can you commit to caring for the tree, which involves annual pruning? Second, is it sited in the right place? In order to thrive, apple trees need six or more hours of direct sunlight per day in the summer—light that may have been more readily available decades ago, before other landscaping and neighborhood development took root. Lastly, do the tree’s shape and the flavor of the fruit warrant renovation? The ‘rose-colored palate’ by which we judge our own tree’s fruit can overcome only so much neglect. If you answered no to any of these questions, forget about trying to renovate the tree. Just take it down to ground level with a chainsaw. Thinning apple spurs encourages healthy new growth, resulting in tastier fruit. Renovation involves drastic pruning, so it&apos;s best to spread the process out over the course of two to four years to avoid shocking the tree. Depending upon your pruning experience and the size of the limbs you need to trim (which may be substantial), consider hiring a professional arborist to make some of the cuts. The best time for renovation is late winter or early spring because you can easily see the tree’s structure before leaves start growing, and pruning wounds heal quickly at this time. To start, look for the tallest limbs on your tree. Then visually follow those limbs down to the point where they attach to the trunk or a strong side limb. You&apos;re looking for the connection of a healthy branch that occurs near a good post-renovation height for the tree—10 to 15 feet is ideal if you’re averse to climbing ladders, like me—and one that will help the tree maintain a pleasing form. Once identified, this is where you will make the first pruning cut. Take a deep breath, and use a sharp bow saw or chainsaw to cut the limb off. In one fell swoop, you’ve lowered the tree and let light access the remaining branches. Repeat this process on one or two more of the tallest limbs, with an eye toward keeping a nice shape as you lower the tree and thin it out. Vigorous, vertically growing waterspouts can block sunlight; most should be removed. From here, you’ll make increasingly finer cuts. No doubt your tree has a number of dead, diseased, or broken branches; cut them down to healthy wood, which you can identify by its light-colored interior. Next, tackle the waterspouts—vigorous, vertical shoots rising within the tree or from the ground beside the trunk. Waterspouts will block sunlight to other parts of the tree, so cut them away completely unless they are particularly well-positioned to become part of the tree’s new main framework. Then look within the canopy of branches for any thin, drooping, weak stems. Shorten these stems so they no longer droop, and thin them out wherever they are crowded. 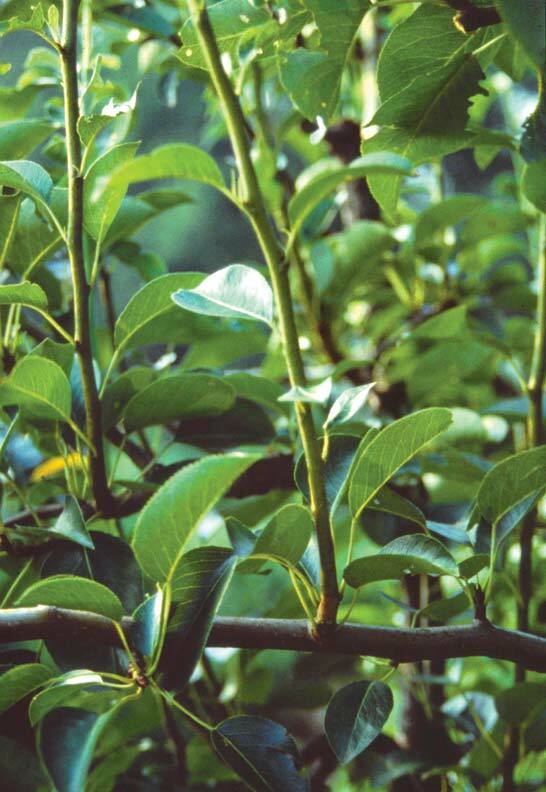 While your pruning effort has removed some flower buds (and potential fruits), don’t worry about displacing too many. Each bud opens to five flowers, and apple trees need just five percent of their flowers to develop fruit in order to produce a good crop of apples. In addition, apple trees bear fruit on very short stems called ‘spurs,’ which elongate just a fraction of an inch each year. Over time, these stubby spurs get crowded and decrepit, and must be thinned in order to coax new growth. 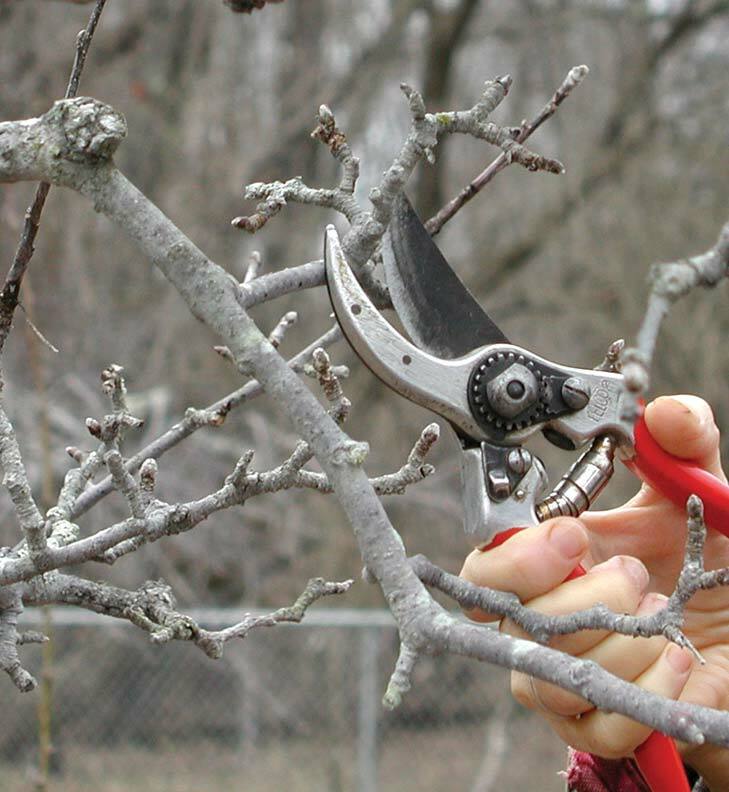 Continue the fine-tuned pruning by completely clearing away some spurs, and taking a side branch or two off of others. Lastly, refresh the tree’s attractive mottled bark by rubbing it with a balled-up piece of chicken wire, to remove loose flakes and help limit pests. 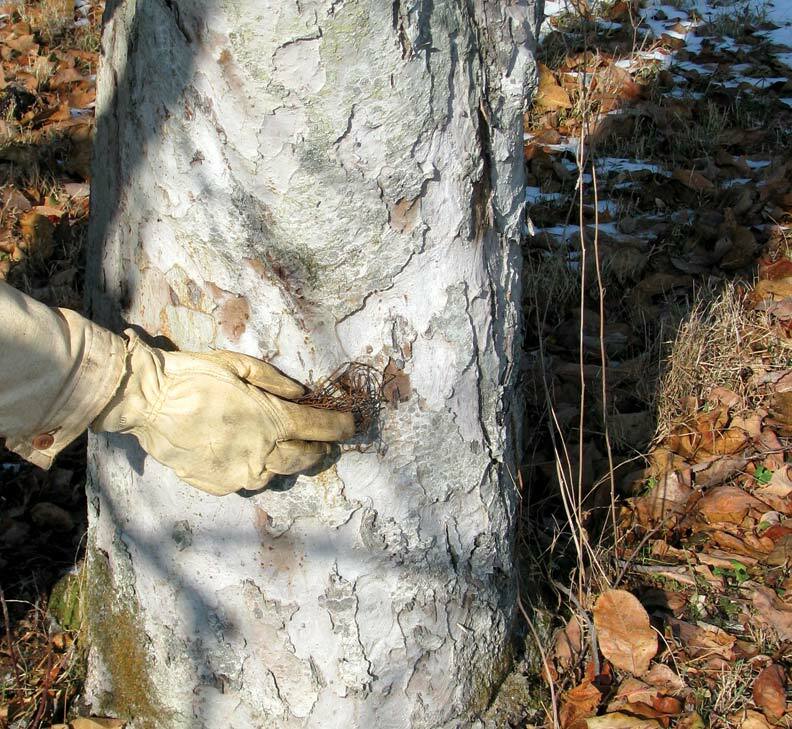 Rubbing trunks with balled-up chicken wire helps exfoliate the bark and limit pests. You’ve now finished renovation for the season. As spring turns into summer, you’ll notice new watersprouts developing close to your pruning cuts; grab them by hand as they appear and remove them with a sharp downward pull. If a few waterspouts sprout low on the tree in good position to build a new framework of future limbs, leave them alone. Repeat this entire renovation procedure for two or three years. After this time, your tree will have a new shape from old limbs that have retained their charm, become more productive, and be well on the road to its former glory. Lee Reichhas authored many books about gardening, including The Pruning Book, which covers a variety of pruning techniques in-depth.